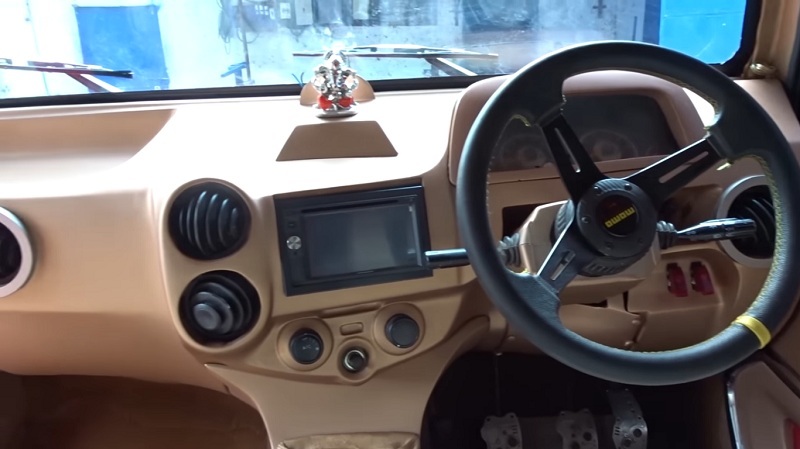 The 'Indian Hummer' is the craziest modification made to a Mahindra Thar yet. Indian customisation shop, SP Designs, has introduced a new custom package for the Mahindra Thar that transforms the exterior to emulate the look of a Hummer. This is one of craziest modifications made to the unassuming Mahindra Thar yet. The exterior has been totally redone, featuring a Hummer-inspired wide grille with vertical slats, projector headlamps, massive flared fenders, plastic skid plates on the front and rear bumpers, faux air intake on the bonnet, sideboards, larger black plastic ORVMs, LED tail-lamp, 21 inch Maxxis Bighorn tyres wrapped around GT alloy wheels. One thing that the Thar-turned-Hummer has going for is its incredible road presence and being the only one of its kind, so expect it to turn many heads. The interior has been stripped out, featuring a Toyota Etios-based dashboard, custom steering wheel, touchscreen audio system, aluminium pedals and a roof mounted LED TV. It also features faux PVC upholstery for the seats and headliner with a huge fascination for diamond patterns. Under the hood is likely to be the familiar 2.5-litre CRDe engine that develops 79 kW (105 bhp) and at 3,800 rpm and 247 Nm of torque between 1,800-2,000 rpm, which channels power to the wheels via a 5-speed manual transmission. The interior has been stripped out, featuring a Toyota Etios-inspired dashboard, custom steering wheel, touchscreen audio system, etc. SP Designs is charging INR 8 Lakhs for purchasing and fitting the customisation package (excluding the donor Thar).